From the most authentic to the most sophisticated, let’s guide you to the best beaches to visit when chartering a luxury yacht in the French Riviera. Plage de Notre-Dame is considered to be one of the finest in France. Not only a delight for the eyes but for the nose too, with the fresh natural scents of eucalyptus and pine filling the air. This beach is on Porquerolles, one of the three islands of the Hyeres archipelago (located just off the western side of the French Riviera coast). After featuring in ‘And God Created Woman’ in 1956, Pampelonne Beach became one of the most legendary beaches on the French Riviera. With its vibrant night and day atmosphere, Pampelonne Beach celebrates the sheer glamour and bliss of St Tropez life. Accessible by boat, it’s the perfect spot for a beach-lover’s charter itinerary with the availability to hire cabanas and private sun-loungers. 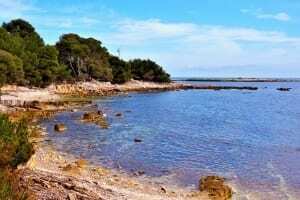 Just off Cannes, on the Lerins archipelago, Sainte-Marguerite island is predominantly covered by pine forests and home to secluded pebbly beaches with crystal-clear water lapping tranquil little coves. Many wild beaches lie on the island for you to explore. Sticking to just one would practically be a crime! Cruising towards the Lerins islands makes the perfect break from the buzzing French Riviera, allowing you to reconnect with nature and discover quiet solitude. Divers and snorkellers will be overwhelmed by the diversity of the seabed, birdwatchers will love observing numerous bird species while sunseekers will be keen to bask on the beach. Larvotto Beach is Monaco’s only beach. It’s an ideal spot to sunbathe whilst enjoying the most delicious cuisine. It is also family friendly with facilities aimed at kids. Although Larvotto Beach is accessible to the public, there are private stretches for those seeking exclusivity. Among them, La Note Bleue, offers parasols and a solarium to hire to perfect your tan. Located on the peninsula between Juan-les-pins and Antibes, La Garoupe Beach was instrumental in making the French Riviera famous back in the 1920s. It’s the perfect spot to anchor your chartered yacht and see where Hemingway, Picasso and Fitzgerald used to spend their summers. La Garoupe is a silky soft white sandy beach with numerous private beach clubs. The most sophisticated and recognisable, by its long wooden jetty, is Plage Keller. To find out more about chartering in the French Riviera, call +44 (0)207 499 5050 or email us.